Accessorizing one’s wedding reception is filled with endless options. Recent reception trends have begun to break away from traditional norms and move toward a reception that is livelier, less formal and more unique. Wedding planners are doing away with congested buffet lines and formal round-table seating and instead, providing standing cocktail tables and dinner stations. Scattered cocktail tables have the ability to provide a “happy hour” atmosphere, allowing for active foot traffic and socialization. Dinner stations and buffet-style dinners, while similar, have distinct differences. Both dinner options allow the guests to intermingle while receiving their food, but the ever-trending dinner stations group dishes by types of food at different locations in the room. Consider metallic linens in soft champagne or blush for subtle elegance and flair on the cocktail tables or floral arrangements for the dinner stations with “edible” items like sprigs of rosemary or basil in a mason jar. 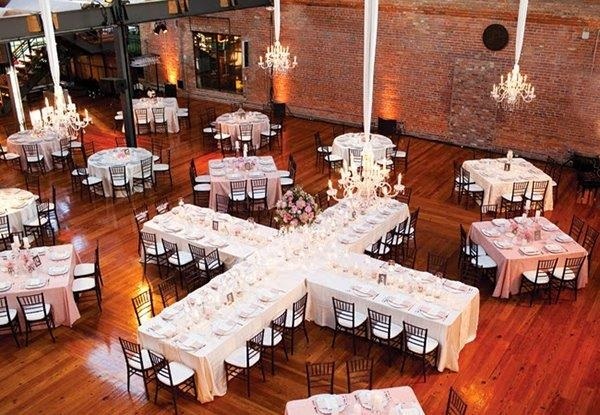 The traditional style of either round or rectangle tables have been a staple of wedding receptions for quite some time, but many wedding-planning experts recommend a mix of round, banquet and square tables to offer different flow patterns for guests and to increase interaction from one end of the venue to the other. Mixed tables allow you to setup for a various numbers of guests at tables. This reception trend also offers opportunities to personalize with different styles and sizes of centerpieces, such as wild-flower centerpieces to give off a rustic “fresh-picked” look or runners of natural greens like magnolia leaves. The mixed-table method, combined with tonal linens and different textures, tends to add a more unique look to a reception. The layout of mixed tables can offer an intimate yet unrestricted setting where guests can be accommodated and arranged easily for a successful and enjoyable event. I would love to be able to have a good wedding venue. I want to be able to have enough space for everyone. I want to have it be near by as well.